For deep-water denizens like pancake batfish, threat is from underwater oil plumes. The Deepwater Horizon oil spill has already claimed many victims - from pelicans to oyster beds and precious marshland. But there may be one more: a species only just recently discovered. Scientifically known as halieutichthys aculeatus, it is not a thing of beauty. But it lives an anonymous sort of existence on the seabed of the Gulf, some 1,500 feet below the waves and - like all marine life in the gulf - plays its role in the food chain. Its more digestible name is the Louisiana pancake batfish. And if oil stays deep under water, the gulf could lose it before it's even officially recognized as a species. 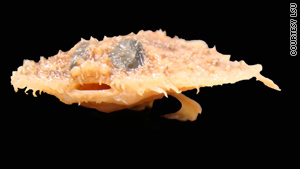 While scientists are uncertain what the long-range effects of the massive spill will be on the gulf's delicate balance of life and death and its complex food chain, the little-known Louisiana pancake batfish is a case in point of one species whose very existence is in that balance.